It's been close to 5 years since Snapchat changed the game with the release of its stories feature. The idea of allowing users to create volatile video and increase daily engagement was a smash hit that was soon replicated by just about every major platform. It started with Instagram, then Facebook, then Whatsapp. The Facebook group of Companies has had major success with the copycat feature and continues to dominate social engagement worldwide. Google continues to lose ground in the social media sphere finally admitting defeat and shutting down Google+ and now looks to turn YouTube into its social media flagship project. In a bid to remain relevant with times, increase user engagement and time on site YouTube has turned to stores. The video hosting giant and 2nd largest serach engine are now rolling out its Instagram-like stories to more users. The launch should really come as no surprise as 1, this has been a breakout trend in digital for the past years and secondly, YouTube has been in testing since last year. Who can use YouTube stories? Even though the feature will be launched globally it will not be available for every user. Only YouTubers with over 10,000 subscribers can publish stories on the mobile app, which can be viewed by subscribers and non-subscribers. Stories will automatically appear in the “Up Next” sidebar when watching a video from a creator who has recently published a story. No word has been mentioned on if or where it will be used or displayed on the desktop or mobile version of YouTube's website. Where can you find YouTube stories? They will also appear in a carousel at the top of subscribers’ home screens. YouTube offers the same creation tools for stories as other platforms like Instagram and Snapchat. However, that’s where the similarities end. YouTube looks to retrofit the functionality towards its user experience and journey so content creators need to be aware of what these tweaks are. Users should be aware of some distinct differences between YouTube stories, and stories on other social media apps, before publishing one. I'm pretty sure many creators won't and end up hurting their online reputation, but this is to be expected. YouTube won't mind in the slightest as it's not adverse to having creators cause blunders while using their services. How are YouTube stories different? Unlike stories on other platforms, which expire after 24 hours, YouTube stories remain online for 7 days. So creators should try to make sure what they publish will still be relevant up to 7 days after the posting date. When a user responds to a creator’s story it’s available for the whole community to see. Replies to stories on other platforms are typically sent privately via direct message. When a user replies to a YouTube story it’s added as a comment, which other users can upvote or downvote. Strangely, creators can only reply to comments with a photo or video, which is then shared as another story. Instead of being a way for users to create volatile content YouTube has turned their stories into more of a behind the scenes tool for creators to share more of the content left on their hard drive/editing room floor so to speak. YouTube will no doubt push this on their creators and many will adopt it without a second thought. The feature will look to leverage creators need for attention and use that to keep audiences on site longer. 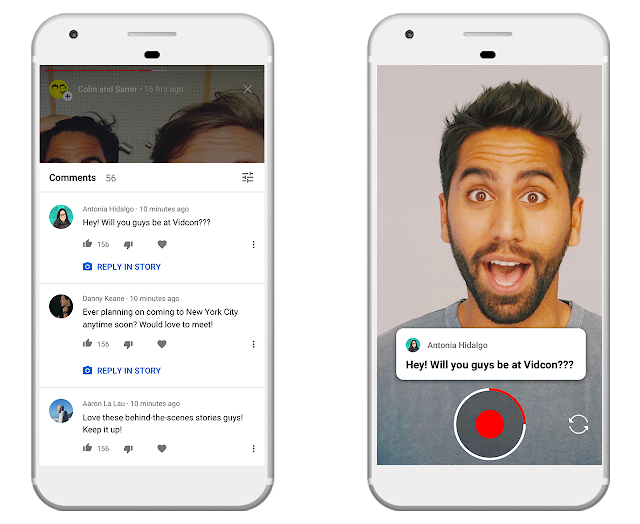 YouTube will pair this feature with its push notification system to bring users back to the site more often and also improve viewer return rate which always has a knock-on effect on add impressions and revenue. You can see the thinking behind it by limiting it to only popular channels and creators. I also have no doubt that YouTube will eventually violate the sanctity of stories with ad monetisation as soon as views reach a certain level. YouTube has been dominated by the independent creator but that's not to say brands don't have a place on the platform. They have simply been marginalised by user-generated content and have been encouraged to use paid features to get views on YouTube, that's basically how the ecosystem currently functions. The new stories feature presents an opportunity for digital marketers to revitalise dormant brand accounts with weekly conversational content to get users engaged with the brand in a public forum and remain top of mind. What do you think of the launch of YouTube stories? Is there an opportunity for brands? Are stories another way for creators and influencers to monetise their efforts? Is it just a fad that YouTube have got on too late?